Chilli Cheese Tops - 15DKK = $2.13USD. Dip - 5DKK = $0.71USD. As a part of the 75 DKK Homestyle combo, you not not only received the burger and fries, but you also had a choice of one of 5 "premium" dips. Most were pretty standard flavours to be honest, and I can't really remember what they were, but one was Dijon Mustard, and another Bearnaise (which I probably should have ordered to be honest) but the one that caught my eye was the "Chilli & Cheese Dip" or so I thought...as when I received my tray, I had both a separate Chilli, and a Cheese Dip! To make things worse, when I looked at my change, I found that they had actually charged me 5 DKK ($0.71USD) for the 'extra' dip. Oh well..We opened Chilli then and there there, and saved the Cheese dip for another day. The Chilli Dip was actually made in the UK, and it wasn't overly sweet like the Chilli dips found in Asia. The dip ended up being easily the best item we had at McDonald's Denmark, as the final item I tried, the Chilli Cheese Tops, were yet another failure. The Wife was so disappointed with both the burger and the fries, she had a taste for an order of standard McDonald's fries. When I went to order her some, I found that even a small fry, was almost $4, so we decided that if we were going to spend that much money, we might as well try something new so in the end we ordered the $2.70 Chilli Cheese Tops. Not to be mistaken with the similar Sir Sombrero that I had from Serbia earlier in the year, these were a completely different product. Like everything else in Denmark, they were very expensive as the 15DKK order gave us only 3 McNugget sized balls. The batter was thin enough to not be 'bready', but thick enough to keep their shape nor allow any of the cheese to leak out. It actually would have been better if most of the cheese inside actually did leak out, since this was some of the worst nacho cheese I've had. The cheese itself didn't have any seasoning or flavour whatsoever, and McDonald's was trying to completely rely on the chilli to give it any flavour, and it just didn't work. 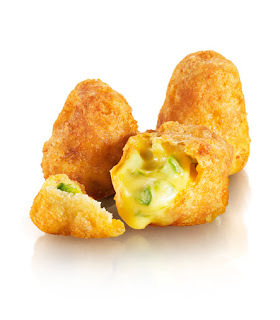 These cheese tasted of watery melted velveeta, and the pieces of chilli, although large and honestly pretty decent looking in the photos, didn't add any spice, flavour or even crunch to the "nugget".